I thought about this for just a few seconds before this sweater came to the forefront. 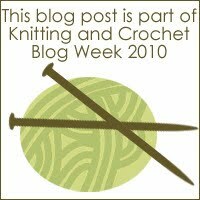 There are many stories with many different projects, but this was probably the major turning point in my knitting career. I had just started as a Freshman at the University of Michigan. I was nervous about what I thought was a large town, since I grew up on a small farm outside of a village of 500 people. All of the sidewalks were foreign to me. For those of you who don’t know Ann Arbor, this is so funny, as the town is Tree City America, and full of greenery. It is all just a matter of perspective. I found a beautiful little yarn shop in the Nickels Arcade not too long after moving away to college. Mind you, this was the first yarn shop that I had ever even entered. My knitting growing up consisted of going to Meiers or KMart for Red Heart yarn. I knew no better. Entering this shop, filled with beautiful natural fabrics, wooden knitting needles (never knew those existed! ), and sample projects to stir my imagination, was magical to me. I can still picture the shop in my mind. I was at school on full finacial aid, with very little money. I took my limited spending money, and bought the yarn for this sweater. 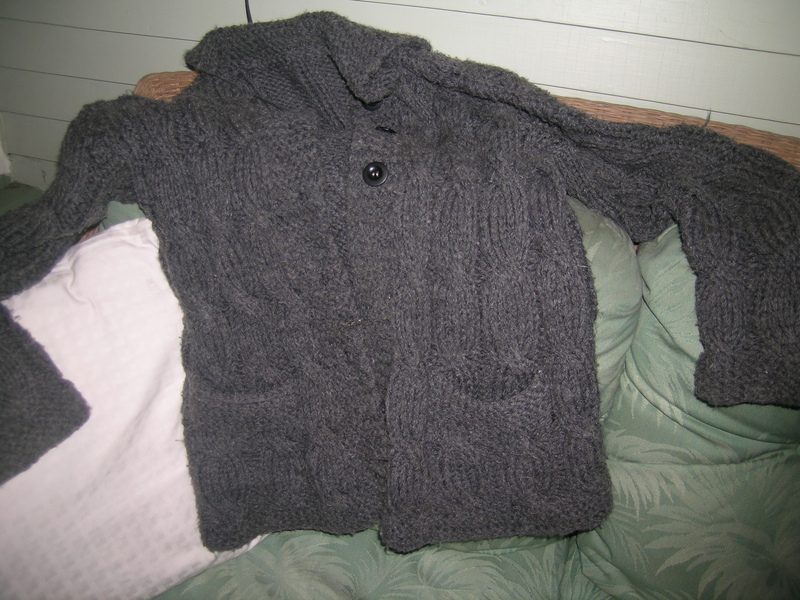 My first wool sweater. I was so excited, I started knitting right away. Our dorm had really wide hallways, and we would all congregate in the hall outside our rooms. I would bring my sweater along, and even though I was the only one who knit, never felt out of place. In fact, got admiration and compliments instead from both the guys and girls on the coed hall. 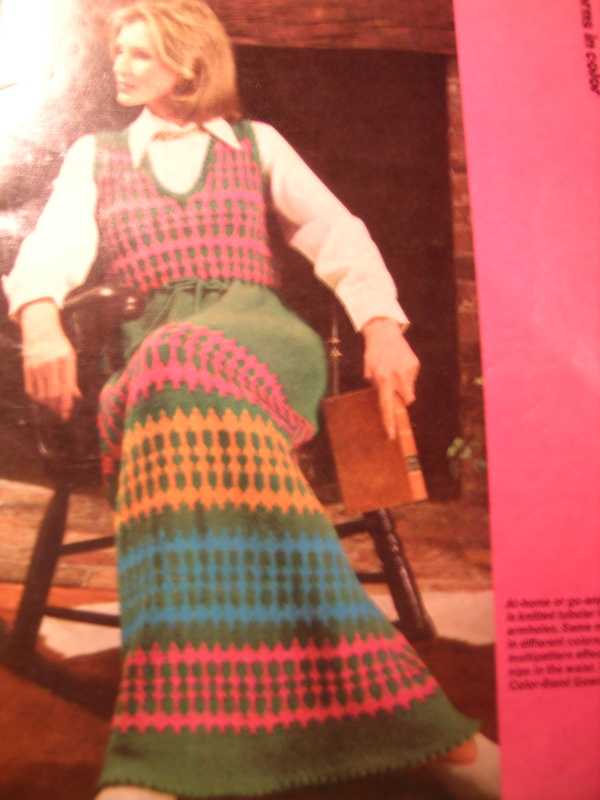 I am not sure if I had this pattern book with me, or bought it there. I think the latter. I had made myself a couple of sweaters growing up, so this was not a stretch, but notice that I copied the color exactly. The book cost $1.25. It actually didn’t take me that long to put my hands on it today. I’ve carried it around all these years. 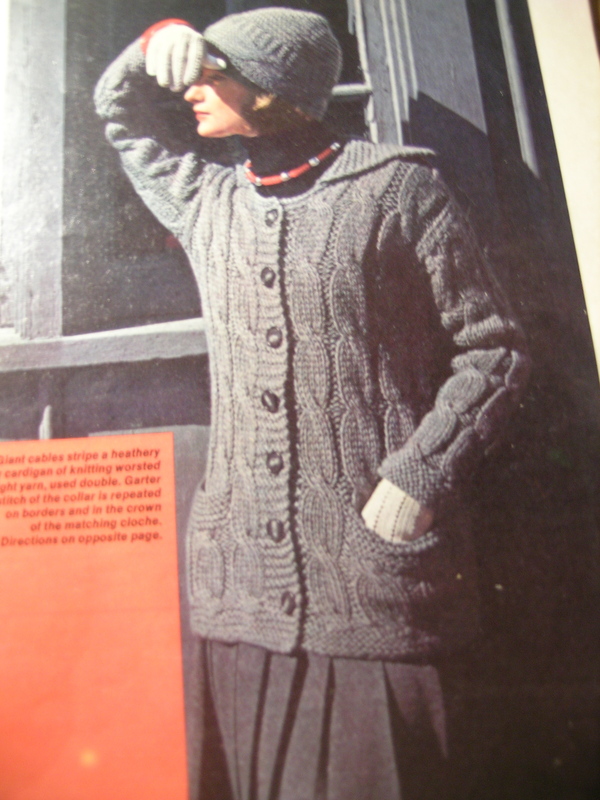 and here, 32 years later, is the sweater that I made, that still rests in my closet, and that I still pull out to wear around the house every winter. Writing this reminded me of my neghbor in the dorms, Greer Chesher. When I finished knitting the sweater, she asked where it was. I told her that I hated sewing them together (some things never change), so she took it from me and returned it beautifully put together. At the time, she seemed so much older and wiser, I believe she was a Junior. Good thing that I had taste, even back then, because this was in the magazine also, along with some other beauties! Beautiful sweater. I live about 20 mins. north of Ann Arbor. I love our trees and lakes. Are you still a Michigander? Regretably no. I moved to Chicago after school, and have been here since. Wow that is great that after al that time your sweater is still going strong. It’s interesting that some designs from past decades have lasted well and still look good to a present-day eye and some just don’t. 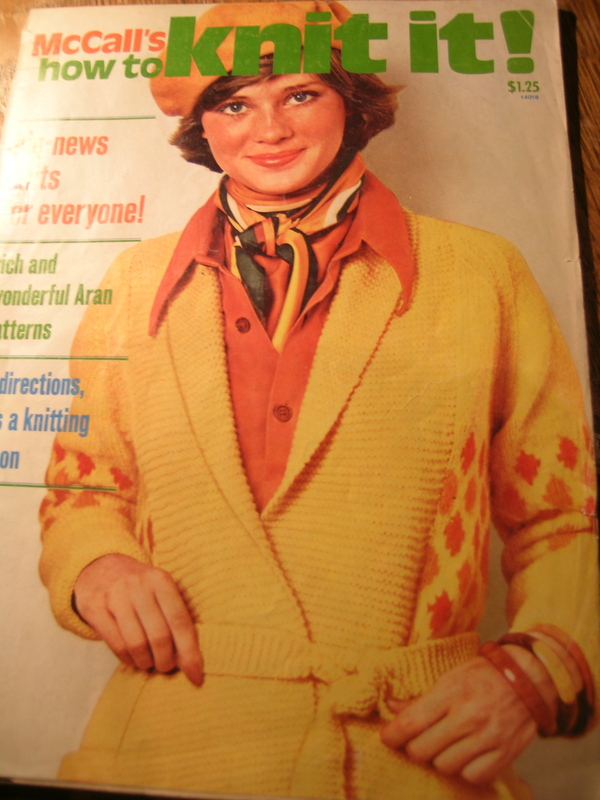 My past project for Knit and Crochet Blog Week was from a 1973 magazine, and some of the other designs in the same magazine I remember that I didn’t like at the time, and don’t like now. Is it good taste that we chose ones that would last? It would be nice to think so. Maybe we also have an eye for a classic design – I think if you’re knitting something that’s going to take a while to complete, you tend to avoid this year’s trend and try to pick something that you’ll want to go on wearing. Frances, this was a beautiful story, I remember how hard it was for you when you went to college. I admire you for everything you lived through and how you have grown over the years. Perseverance paid off–you are a strong and beautiful person (inside and out). Wow! Thanks so much. People will think that I paid you to say this.